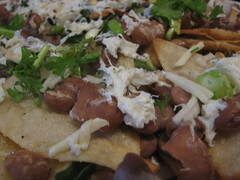 I first discovered the beauty and simplicity of making nachos in college. A friend bought corn tortillas to make burritos but he wanted flour tortillas and was very disappointed. Instead of throwing out the tortillas, I played around and cut them up and baked them in the oven with oil and salt and I had that moment of AHA! I am a genius! I felt as if I had invented nachos and nothing would ever be the same again. Obviously, I did not invent nachos but used my intuition to make them, which was deeply satisfying. My husband bought some corn tortillas last week for tacos but I am not a fan of store-bought corn tortillas for anything other than turning them into nachos. I bought some flour tortillas so I could get my burrito on, but with the corn torts, I went all out. I FRIED THEM. An old saying goes, “Everything tastes better fried.” While this may be true, I don’t really want to eat everything fried all the time. It’s not ideal for the body. I prefer baking or sauteeing, but tonight I wanted that greasy fattiness and it would be a good use for the Teese Vegan Cheese I bought. Making nachos is easy but borderline dangerous (hot oil). I simply cut the torts to a desireable size, heat some canola oil in a skillet (about 1/4″ of oil is fine, or plug in your FryDaddy). Once the oil is good and hot, place the torts in, making sure to give them a little space from each other. 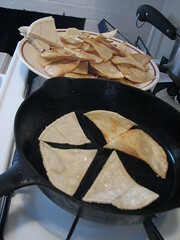 If the oil isn’t hot enough, the nacho will not get browned and crunchy, it will get really greasy. Fry, flip, fry other side. Place on a paper towel (if you want to reduce the grease factor) and sprinkle some salt on top. The end. 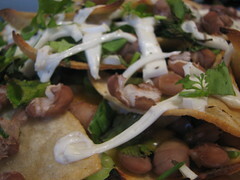 To make my double decker nachos, I spread the chips across a plate, added beans, cilantro, fresh chopped garlic, scallions and Teese. The Teese needs seasoning so I added a little jalapeno flakes, garlic granules, black pepper and of course, salt. I added a little nutritional yeast and kelp flakes because I am crazy and strange sometimes. Then, layer two of nachos and continue with the toppings to your delight. I baked the nacho dish in a preheated oven (at 375deg F) for about 10 minutes, then switched it to broil mode to crisp up the top. I forgot to pack my grater when I moved here, so all i had was the microplane. Teese does not like the microplane, but it makes for an interestingly crunchy topping and a gummed up grater. My other batch I sliced really thin strips and they melted into each other without hesitation. Eat and enjoy. I surely did. I love this! “borderline dangerous” I know what you mean…my boyfriend and I are terrible at frying. And I’m frightened to do it…but this looks so good! Thanks!